Town in the province of Hanover, Prussia. 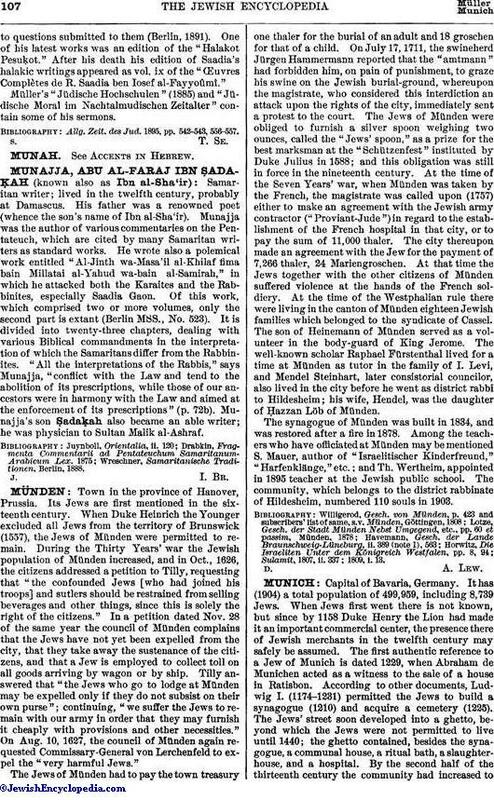 Its Jews are first mentioned in the sixteenth century. When Duke Heinrich the Younger excluded all Jews from the territory of Brunswick (1557), the Jews of Münden were permitted to remain. During the Thirty Years' war the Jewish population of Münden increased, and in Oct., 1626, the citizens addressed a petition to Tilly, requesting that "the confounded Jews [who had joined his troops] and sutlers should be restrained from selling beverages and other things, since this is solely the right of the citizens." In a petition dated Nov. 28 of the same year the council of Münden complains that the Jews have not yet been expelled from the city, that they take away the sustenance of the citizens, and that a Jew is employed to collect toll on all goods arriving by wagon or by ship. Tilly answered that "the Jews who go to lodge at Münden may be expelled only if they do not subsist on their own purse"; continuing, "we suffer the Jews to remain with our army in order that they may furnish it cheaply with provisions and other necessities." On Aug. 10, 1627, the council of Münden again requested Commissary-General von Lerchenfeld to expel the "very harmful Jews." The Jews of Münden had to pay the town treasury one thaler for the burial of an adult and 18 groschen for that of a child. On July 17, 1711, the swineherd Jürgen Hammermann reported that the "amtmann" had forbidden him, on pain of punishment, to graze his swine on the Jewish burial-ground, whereupon the magistrate, who considered this interdiction an attack upon the rights of the city, immediately sent a protest to the court. The Jews of Münden were obliged to furnish a silver spoon weighing two ounces, called the "Jews' spoon," as a prize for the best marksman at the "Schützenfest" instituted by Duke Julius in 1588; and this obligation was still in force in the nineteenth century. At the time of the Seven Years' war, when Münden was taken by the French, the magistrate was called upon (1757) either to make an agreement with the Jewish army contractor ("Proviant-Jude") in regard to the establishment of the French hospital in that city, or to pay the sum of 11,000 thaler. The city thereupon made an agreement with the Jew for the payment of 7,266 thaler, 24 Mariengroschen. At that time the Jews together with the other citizens of Münden suffered violence at the hands of the French soldiery. At the time of the Westphalian rule there were living in the canton of Münden eighteen Jewish families which belonged to the syndicate of Cassel. The son of Heinemann of Münden served as a volunteer in the body-guard of King Jerome. The well-known scholar Raphael Fürstenthal lived for a time at Münden as tutor in the family of I. Levi, and Mendel Steinhart, later consistorial councilor, also lived in the city before he went as district rabbi to Hildesheim; his wife, Hendel, was the daughter of Ḥazzan Löb of Münden. The synagogue of Münden was built in 1834, and was restored after a fire in 1878. Among the teachers who have officiated at Münden may be mentioned S. Mauer, author of "Israelitischer Kinderfreund," "Harfenklänge," etc. ; and Th. Wertheim, appointed in 1895 teacher at the Jewish public school. The community, which belongs to the district rabbinate of Hildesheim, numbered 110 souls in 1903. Sulamit, 1807, ii.337; 1809, i. 13.